My father was born in 1949 in Hunslet, Leeds to a working class family. My grandmother was a housewife and my grandfather had several jobs. He was first trained as a worker at Fowler’s factory, which made steam trains and tractors, and tanks during the WW2. He was later a postman and always had a love of gardening and growing plants/flowers. My father held several posts. He was President of Leeds Jama’at and then the National Tabligh Secretary in the early 1980’s. He was sent as a representative of UK to the last Jalsa in Rabwah in 1983. He visited Pakistan in 1974 after the riots before the court rulings where the Third Khalifa (may Allah have mercy on him) asked him to visit some villages affected by the riots and observe the condition of the Ahmadis there. He worked also at a local level often organizing exhibitions and articles in the press. 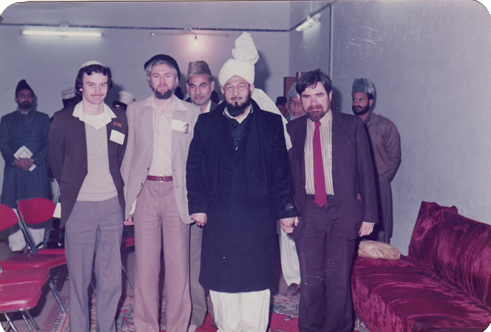 at the 1983 Jalsa Salana in Rabwah, Pakistan. My father had a broadly Christian teaching at school, as did all English children of his age, but his family did not attend church much, if at all. He passed his 11 plus and then went on to ‘A Levels’. After one year working for Leeds Council he decided to return to studying and to become a trained teacher. My father lived a normal British life, his interests were reading books, traveling and gardening. My father was a schoolteacher in UK and in the Middle East. My father was an avid learner. He consumed knowledge of all types and had an excellent memory. He had a deep love of history and had studied Roman history at college as an area of special personal interest. He was a person who was always thinking about the world around him and considering the system of things. So perhaps it is this quest for knowledge and a broadminded attitude towards new cultures and beliefs, which led him towards Islam. I think essentially someone has to be looking for something in order to find it. My father was always looking for knowledge and so maybe Allah put the most perfect knowledge in a place where he would find it. My father’s perception about this question, I cannot answer, but I would say that he was an open minded person in general. He liked to discover for himself rather than to react to hearsay or speculation. I always heard my father say that it made sense. It did not rely on the fanciful and magical and moreover, the issue of how Jesus survived the crucifixion also seemed to fit. In fact my father had a great respect for the writings of the Promised Messiah, he had studied them and always said that it was the writings which would attract new people, because they gave a clear message. But more than anything my father was an independent thinker. 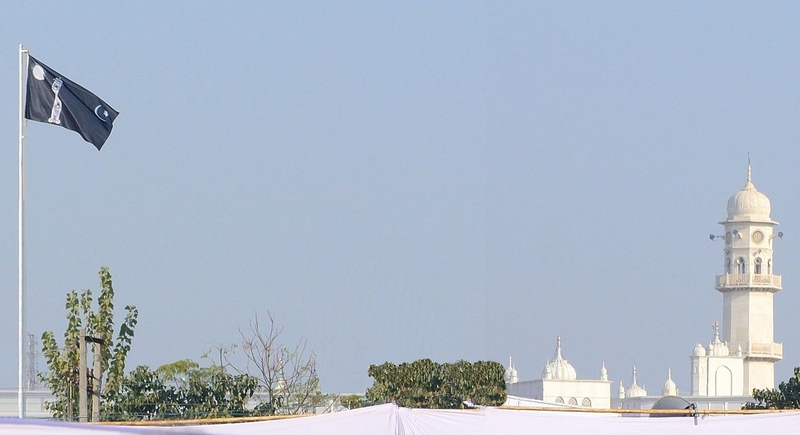 He would consider all sides of an argument before reaching a conclusion and in studying Ahmadiyyat the conclusion he reached is that the Qur’an and the claims of the Promised Messiah were true. My parents were engaged to be married and living in the same house with some other college friends. My father was working with another Ahmadi teacher who would offer him a life home. After the lift my father, wanting to be polite, would invite him in for a cup of tea. It was at these times that they began to talk about religion in general and Islam. My parents were given books of Ch, Muhammad Zafarullah Khan Sahib and others. They were impressed with what they read, continued to read and finally accepted Ahmadiyyat. 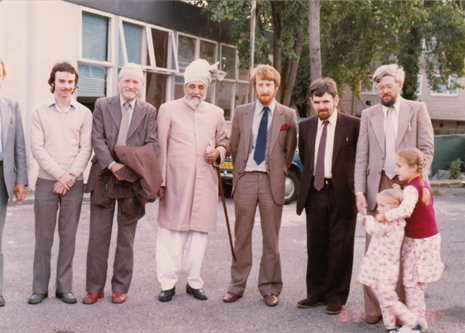 They went on a trip to London to visit the Fazl Mosque once before Bai’at. They went alone and when they saw the gates of the mosque they felt hesitant and were about to leave when Imam Ata ul Mujeeb Rashid came out and spoke to them. He took them inside and they began a long friendship with him. I am always glad that they never did turn around and that Imam Sahib came out. But my mother has often said that, just as Churches do, the mosques should have a notice board which lets people know when the services are so public walking past can join at the right time if they like. Again I never knew my father when he was not a Muslim so this is hard to answer. But for me it gave him a respect for God and for the message of religion. My father studied all religions through the lens of the Holy Qur’an. He saw truth in scripture because he always took the Qur’an as his starting point. He had no doubt that Islam was true. He was a humble person. He often said that he was happy with enough, he never searched for more and more. He had a great deal of patience. He would mostly remain calm and try to control his anger. I hope Islam brought these traits to the fore, although they may have already been there within him. We always had a good relationship with my grandparents. We spent time with them at Christmas and also throughout the year. They never served us pork or alcohol or ate it in front of us. There was always a relationship of love and respect. My grandmother has said that she does not like me wearing a scarf as she lives in a small village in Cornwall and feels that it draws attention towards me. She was also not comfortable coming into the mosque on my Nikah and she is not used to large crowds. For me, being a Muslim was not an issue. It did not change the love between my father and his family.